«©NCSX» Deadly Kasumi. Radiant brown hair, big brown eyes like a doe, and as skilled on the battlefield as any properly trained killer. There's a softer side to Kasumi however. In another life, she could've been an innocent civilian with a normal family and without a legion of cunning ninja on the hunt for her hide. Kasumi might have been someone who looks forward to big holidays, carves pumpkins with a Ginsu, and slurps imitation eggnog dispensed from a paper carton. Someone who dons a Santa cap and matching outfit to ring in Christmas like a champ. Alas, the Fates had other plans and machinations in store for her. 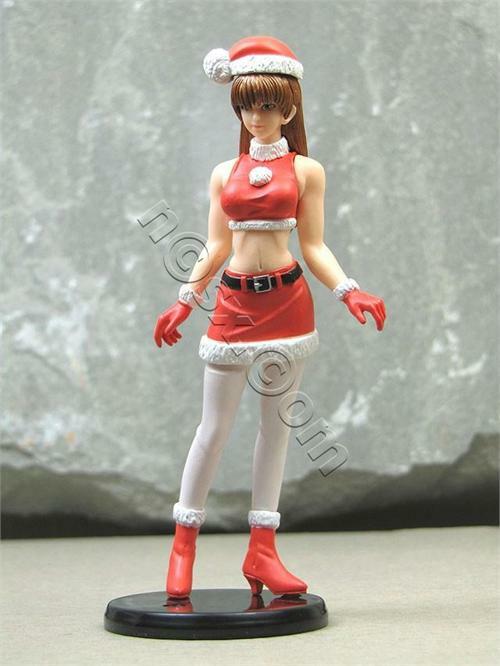 Brand new and factory sealed Dead or Alive Ultimate Kasumi Santa Outfit Gashapon Toy which was originally released in 2004 for the Japanese market. This figure was a special variant from the DOA Ultimate gashapon set manufactured by Bandai. Kasumi measures approximately 4" tall and requires some simple assembly to put the figure together. Kasumi's torso will arrive intact along with her arms and head but you'll have to push her legs into the torso. Kasumi's Santa hat is included as an accessory which may be plopped on top of her head. A display stand with three insertions holes is included for Kasumi's pre-pegged feet.